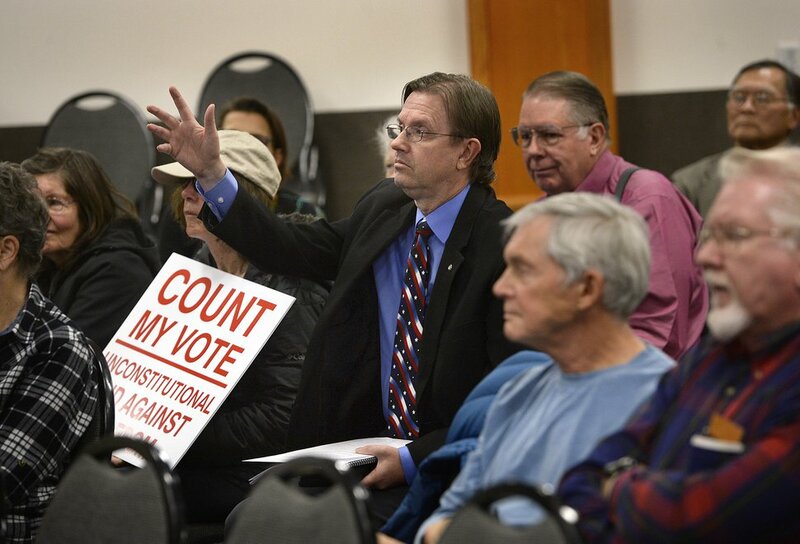 Opponents of the Count My Vote initiative proclaimed Tuesday that they have persuaded enough people to remove signatures from the petition to block it from the ballot, although supporters say that remains in doubt and possible legal challenges loom. Meanwhile, the battle against a proposed medical marijuana ballot measure included a surreal midnight showdown at Davis County government offices, attempts to make end runs around official deadlines, and reports of an LDS bishop calling church members to pitch in on a last-ditch attempt to persuade petition signers to withdraw their support. It may take until June 1 for all the dust to settle. That is the deadline for Lt. Gov. Spencer Cox to certify which initiatives will appear on the Nov. 6 ballot. Justin Lee, state elections director for Cox, says his office may need all that time to review and verify rescission letters being forwarded by county clerks. “I think everyone should plan on us announcing everything right around June 1,” he said. To qualify for the ballot, initiatives need voter signatures equal to 10 percent of the votes cast in the last presidential election — a minimum of 113,000 statewide — and must achieve that percentage in at least 26 of the Utah’s 29 state Senate districts. Groups opposing Count My Vote and medical marijuana waged large-scale drives hoping to prod people who had signed petitions to remove signatures in enough Senate districts to keep them from qualifying for the ballot. These efforts often included allegations that supporters made misleading claims to get the signatures in the first place. The deadline to submit rescission letters was Monday. That surprised some groups opposing initiatives, who said they earlier were told they had through Tuesday to submit them. But Lee said the law requires the letters to be submitted “by May 15,” not on that date. “We had no idea, and had to rush,” said Brandon Beckham, director of Keep My Voice, which opposes Count My Vote. That ballot initiative seeks to cement two paths to the ballot for candidates: the caucus-convention system and/or collecting signatures. Opponents favor just the caucus-convention system. Count My Vote already clearly failed to collect enough signatures in three districts, according to preliminary counts posted by Cox’s office on Tuesday — the deadline for counties to submit totals. So falling short in just one more district could keep it off the ballot. In Senate District 7 in southern Utah County, Count My Vote had only 35 votes to spare. In Senate District 29 in Washington County, it was up by only 187 signatures. In Senate District 21 in Davis County, it was up by 393. Beckham said his group collected far more than those numbers in each of the three districts. “A declaration of victory by anyone at this point is probably premature,” countered Rich McKeown, executive co-chairman of Count My Vote. (Scott Sommerdorf | The Salt Lake Tribune) Former Utah Rep. Fred Cox tries to get recognized in order to ask a question during the Count My Vote public hearing at the Whitmore Library in Cottonwood Heights, Friday, Oct. 27, 2017. 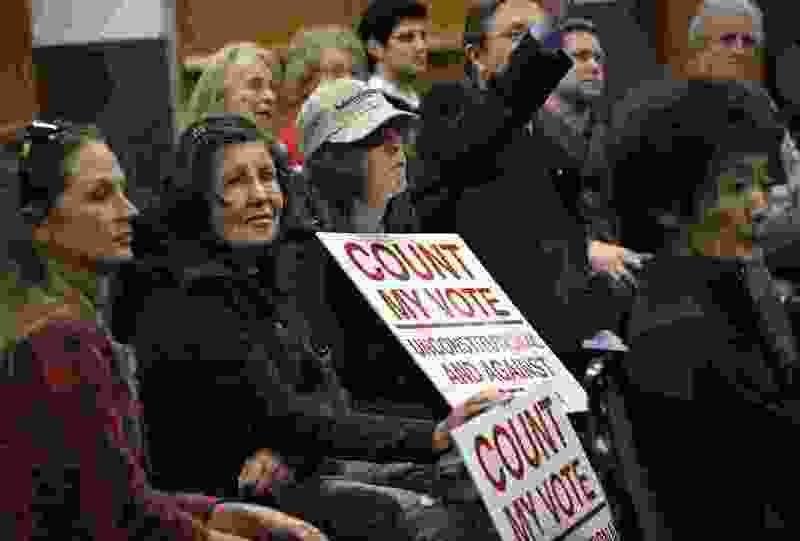 The Count My Vote ballot initiative seeks to select party nominees through a direct primary, in addition to the traditional caucus-convention system. He said county clerks still had a day, at that point, to finish verifying signatures, and was told that many packets had not yet been processed — while Beckham said he had been told that virtually all name processing had concluded. Beckham contends that paid signature collectors used by Count My Vote often misled people. “Most of the people we talked to didn’t know their names were on the petition,” he said. “Others said they were misled about what it does,” including being told it was to help Mitt Romney appear on the ballot. Disclosure forms filed last month showed Keep My Voice had spent $174,000 to that point on its own signature collectors trying to persuade people to withdraw their signatures. Count My Vote contended, in turn, that Keep My Voice used misleading claims and intimidation of its own. Former Gov. Mike Leavitt and Utah Jazz owner Gail Miller, both leaders of Count My Vote, recorded robocalls to petition signers denouncing Keep My Voice claims. Meanwhile, Drug Safe Utah, the group opposing the medical marijuana initiative, said it is unsure if its efforts were enough to keep the proposal off the ballot. “We just don’t know,” said Mark Fotheringham, spokesman for the Utah Medical Association, one of the key members of the group. He said it is unsure how many people it asked to send rescission letters actually did so. Battles over the medical marijuana initiative took unusual twists late Monday as the deadline approached for any rescission letters — including a bizzare showdown just before midnight at Davis County offices, and an LDS bishop reportedly recruiting political help from his congregants. Davis County Clerk-Auditor Curtis Koch said he warned all groups that his office would close at 5 p.m. on Monday, so that was the deadline for rescission letters to be submitted. He said he then worked very late on a tax presentation he was preparing for the next day. About 10:15 p.m. he noticed “a person at my window staring at me,” then more. He called the police, and asked them to check it out. Schanz said he went to the offices based on suspicions that opponents might try to submit rescission letters after the deadline, and found 25 or so people handing off late collections and trying to get someone inside to accept them. He said he called some news media, and their arrival made opponents scatter. Then Koch came out of his office at 11:20 p.m. He said medical marijuana supporters accused him of trying to accept the opposition’s paperwork late — and would not believe that he was simply there working late. “I was a little annoyed,” he said. “It’s 11:20 at night, I’m leaving my office and my integrity is being questioned.” He said about the same time he called his wife and “she indicated that someone came by the house and dropped off a packet” of rescission letters there. “Now I’m annoyed that people are showing up at my house at what I consider an inappropriate hour to ring a doorbell of a residence,” Koch said. He added the documents were stamped as arriving after the required deadline. “I would say both groups exercised really poor judgment,” Koch said. LDS bishop recruiting members for politics? Meanwhile, Schanz said the majority of the people working late that night seeking rescission letters were Mormons responding to a call from their bishop for help. He provided screenshots of a Facebook post and text reportedly coming from a local Relief Society president relaying her bishop’s call for help to members. “I got this because of a lady who called me literally in tears. She said, ’I’m super supportive of this [initiative], and now my bishop and Relief Society president are telling us all to come out and help remove signatures,’” he said. 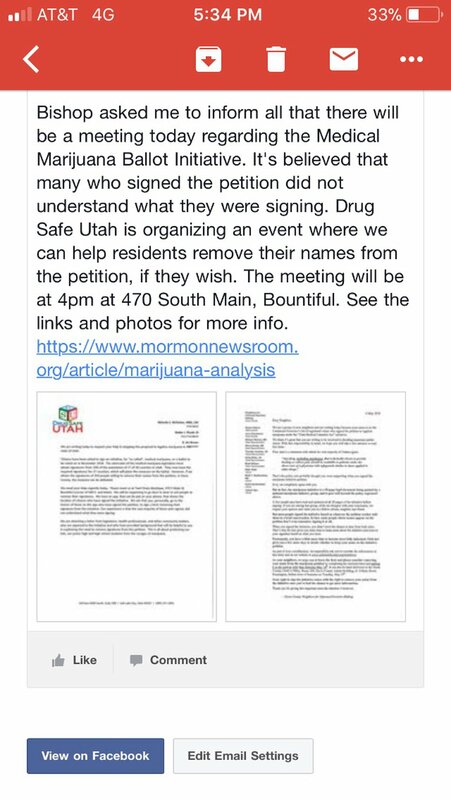 (Courtesy photo | Utah Patients Coalition) Facebook post reportedly from an LDS Relief Society president passing on a request from a Davis County bishop seeking help from members in effort to convince people to remove signatures from a petition for the medical marijuana initiative. 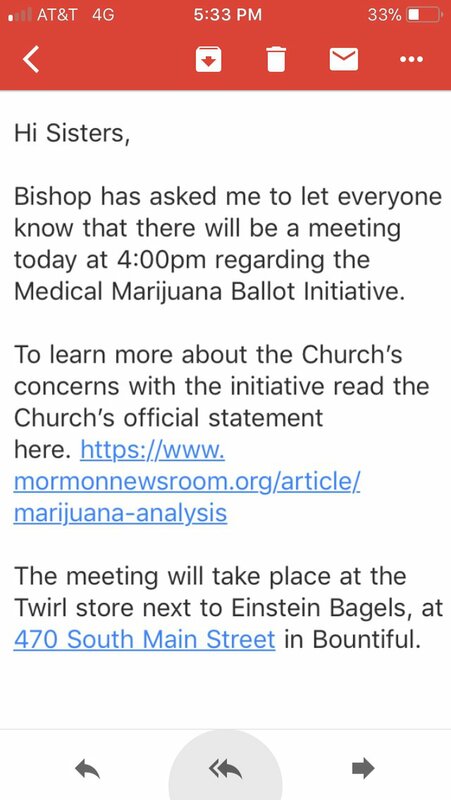 The Facebook post said, for example, “bishop asked me to inform all” about a 4 p.m. meeting at a Bountiful business where organizers would seek help to remove signatures, and contained links to statements against the initiative issued by the Mormon church. Tom Freeman, the bishop who supposedly made the request, declined comment when contacted by The Tribune. The LDS Church’s public affairs department did not comment directly on that, and directed The Tribune to the church’s statement on political neutrality, which includes saying that the church does not “allow its church buildings, membership lists or other resources to be used for partisan political purposes.” But it also encourages members to be involved politically.